At I-Power School of Gymnastics, we strive to instill self-confidence, strength, responsibility and develop our students INDIVIDUAL potential. We enhance their I-POWER! We believe that gymnastics is the greatest sport in the world! Participation in gymnastics not only develops character in it’s participants, but the skills learned in gymnastics set a great foundation for future athletic development. Gymnasts at I-Power range from exuberant 2 year old boys and girls to highly skilled competitive athletes that train up to 20 hours a week. We are fortunate to have the most competitive program in the Champaign-Urbana area. We teach kids to work hard while having loads of fun! We are a school of gymnastics, so we operate just like any other school of education. We offer 4 quarters of class, each 10 weeks long. Participants can join year-round, as class prices are always pro-rated. Preschool aged students are grouped by age in a small instructor to student radio with a new theme for classes every other week. Our School-Age students are placed in classes by ability level and also keep a small instructor ratio to be sure that they are getting lots of personal attention with hands-on spotting. At the end of each Quarter, (10 weeks) students are issued report cards and achievement ribbons for participation. 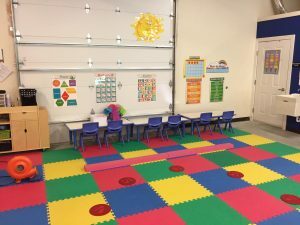 Preschool students continue in their classes based on age, for school-age students mastery of 75% of their report card skills is required for class promotion. At the conclusion of our school year, we hold a Recreational Student Showcase where our students are invited to participate and perform routines learned in class for friends and family. While families can take classes for any quarter that they choose, we do encourage year-round participation to achieve the best results from the sport. For our summer session of classes, we offer a smaller schedule of classes… but also offer half and full day summer day camps all summer long! To see class times or register for a class – Click “Register” on the tabs above. Contact us directly by phone or email with any additional questions. Ages 3 to 5 years old. An educational pre-school program that includes Gymnastics, Language & Listening, Math, Science & Sensory, Fine Motor Skills, and Art. Each week follows a different theme to keep learning fun! Class ratio is 1 instructor for every 6 children. See our Register page for more information. (6-12 months) This class provides a fun bonding experience with your child through music, prop, finger play, and body movement as well as an opportunity to connect with other parents and let your baby meet some new friends. Parent participation required. Little Bears is for toddlers (12-23 months) and increases movement and gross motor skill development. This class offers development in coordination, speed, confidence, and agility. Parent participation is required for this class! Class ratio is 1 instructor to 6 children. Gym Bears is for the adventurous 2 year old needing to burn off some energy! This class offers development in coordination, speed, confidence, and agility. 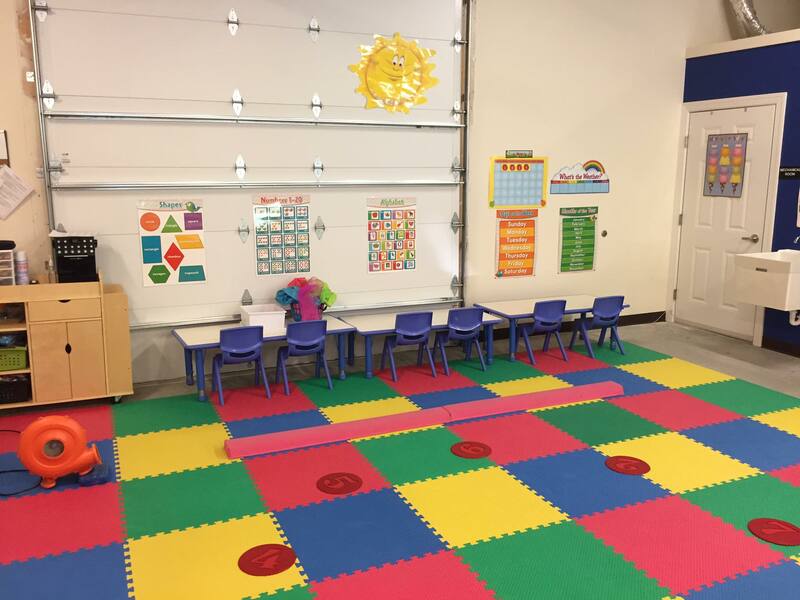 The class is challenging, rewarding, and a cool experience for any preschooler needing structured playtime. Parent participation is required for this class! Class ratio is 1 instructor to 6 children. 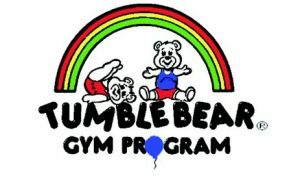 Tumble Bears is for 3 year olds and offers development in coordination, speed, confidence, and agility. 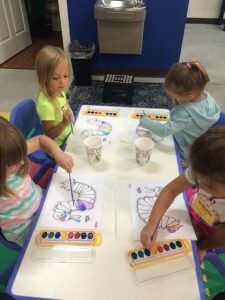 This class is the first independent class that we offer for preschoolers! Your child will become a little athlete without even realizing it! Class ratio is 1 instructor to 6 children. Super Bears is for 4 year olds and offers advanced development in coordination, gymnastics skills, confidence, and agility. We challenge kids in this class to move through each station more independently, learning to develop self reliance and confidence. Class ratio is 1 instructor to 6 children. This class is a combined 3 and 4 year old class and follows the curriculum of Super Bears. Coordination and Independence is a high focus for this age group. Class ratio is 1 instructor to 6 children. Kinder Bears is for children 4 1/2 – 5 years old. This is our advanced preschool class. Obstacle courses and stations are used to master each basic skill. Each week follows a theme with music, fun games and target skills. Class ratio is 1 instructor to 8 children. (5-12 years old) Welcome to Ninja Warrior training! This class enhances coordination, upper body strength, flexibility, speed and agility. Ninjas will learn to safely run, flip, and roll through challenging obstacle courses and participate in team challenges. 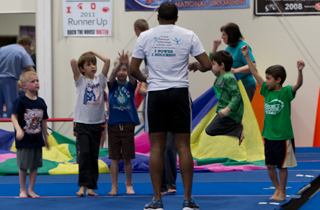 This class is for ages 5-7 and is an introduction to gymnastics basics. Class time will be spent stretching, conditioning to strengthen muscles, and mastering basics on vault, bars, beam, and floor. Each class time will conclude with a fun game. Class ratio is 1 instructor to 8 children. 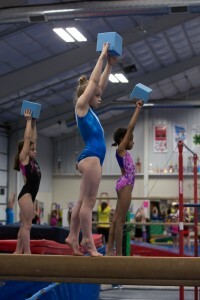 Level 1 is for ages 8 and older and teaches the primary fundamentals of gymnastics. Class time will be spent stretching, conditioning to strengthen muscles, and mastering basics on each of the gymnastics apparatuses. Each class time will conclude with a fun game. Class ratio is 1 instructor to 8 children. Level 2 is for ages 8 and older for children who have mastered the fundamentals of Level 1. Class time will be spent building more refined basics and introducing advanced skills on each of the gymnastics apparatuses. Intro to Xcel is for ages 6 and older for children who have mastered the fundamentals of Level 1 and 2. This class prepares them for entry into our competitive recreational program. Xcel is divided into levels Bronze, Silver, Gold, Diamond and Platinum. Class time will be spent building more refined basics and introducing advanced skills on vault, bars, beam, and floor, with the option of competition. Class ratio is 1 instructor to 8 children. This class is for a group of friends and/or relatives. Class time will be constructed to meet the needs and goals of the participants and their schedule. Beginning tumbling is for ages 6 and older and teaches the fundamentals of tumbling. Class time will be spent stretching, conditioning to strengthen muscles and mastering basic tumbling skills. The Cheer Tumbling class will work to develop specific skills needed to be a cheerleading. Class ratio is 1 instructor to 8 participants. Intermediate tumbling is for ages 6 and older and designed for anyone who has mastered the fundamentals of the beginning tumbling class. Class time will be spent building more refined basics and adding more intermediate tumbling skills such as Round-offs and starting back handsprings. Advanced tumbling is for ages 7 and older and designed for anyone who has mastered the skills of the intermediate tumbling class. The focus is on developing back handsprings, backward connections and back tucks. Class ratio is 1 instructor to 8 participants. Are you interested in providing a unique opportunity for your children? I-Power School of Gymnastics is proud to offer our “Home School Program”. This gymnastics experience for your children is a great way to introduce the fun and excitement of gymnastics in a first-class facility with first class staff. At I-Power our purpose is simple. We serve by ENRICHING LIVES! We believe in positive motivation of children. We teach through our words as well as our actions. You will find our instructors to be energetic, professional, “hands on”, knowledgeable and caring. We invite you to sit back, relax and watch your children have fun under the supervision of our expert staff. The children will be learning skills on vault, bars, beam, floor, trampoline and much more. Classes are scheduled during convenient daytime hours. Click on the “Register” tab above for our homeschool class schedule.